Have you explored the latest trends in conferencing? Konftel invites you to join their upcoming webinar ‘Smart Conferencing – Combine Networks and Applications’ on Tuesday 28th November, at 11 am when Konftel’s Regional Sales Director, Jeff May will be taking a look at the latest conferencing trends and collaboration in the workplace. Konftel’s product line allows for smoother communication across platforms by combining HD IP voice calls with Skype meetings in boardrooms and/or huddle rooms. Prepare yourself for the year ahead and register now for this free 20-minute webinar to learn how the Konftel range embraces Hybrid conferencing and IoT to meet your customers’ ever-changing requirements. We’re pleased to announce the launch of Konftel’s latest SIP conference phone, the 300IPx. Designed to make hosting and attending conference calls as easy and stress-free as possible, with the Konfetl Unite App, users can manage their conference calls through their mobile phone – meaning you don’t have to type in long telephone numbers, conference room IDs and pins! To help you get up to speed on the unique selling points of this new solution we are hosting a free webinar, with Konftel’s Regional Sales Director, Jeff May. Register now to join us on Thursday 7th September at 11 AM. 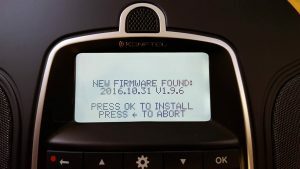 When using a Konftel 300Wx with a Gigaset N300IP or N510IP it may be necessary to upgrade the 300Wx to the latest firmware. If you are having problems making or receiving calls this should sort it. 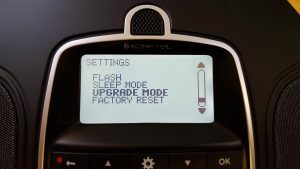 If the phone finds the upgrade file on the SD card, the screen will display the new firmware version. 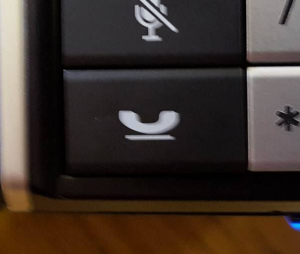 To start the upgrade, press OK. 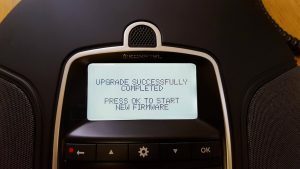 It will then start “Erasing” the firmware and upgrading to the new version. Do not power it off while the upgrade is in progress. If you are still having problems please contact our support team. Konftel has developed a free mobile app for handling conference calls. Konftel Unite enables users to join conference calls and online meetings quickly – an ideal solution for remote workers and staff who are out and about. Users can dial into conference calls with just one click, join sessions in various web meeting applications including Google hangout and WebEx. User are also see a complete overview of their upcoming events and meetings from multiple calendars simultaneously. The app works seamlessly with traditional Konftel devices for optimum audio performance. Konftel’s UK Sales Director, Jeff May, says Konftel Unite is an intuitive and powerful collaboration tool that represents the next step in audio conferencing convenience, putting the power of conferencing in a pocket – anywhere. Users can also receive notifications and call alerts, take text and voice notes and share them with others – as well as see who has been invited to a meeting. We are delighted to launch the new Konftel Ego personal conference phone! Ideal for both business and personal use, the Ego is Konftel’s most portable device yet. With its compact size it is ideal for people who frequently travel and we believe this is set to be the next must have gadget. Featuring both Bluetooth and USB connectivity, the Ego can be easily paired with mobile, tablet and desktop devices. Plus, with advanced NFC functionality, compatible mobile devices can be paired in seconds. 1) go to the web interface of the IP DECT 10 > go to the “Server” tab on the left and “add new server” > add the IP address/URL of your pbx to the registrar box and then save. 2) go to the extension tab at the left side and add a new extension by clicking on any of the numbers 1 – 20 in the IDX column> add the extension number, authentication user name and password from your pbx, tick the box at the top right that says add handset and then save. 3) tick the box next to the extension you just added, then click on “start SIP registration” below the extensions table, now go onto the handset tab at the top, next to extensions, click on the IPEI default of 0000000000000 and change “Alarm Line” to the extension number and press save. 4) tick the box next the handset you just added, then click on “Register Handset” under the handset table. 5) on the handset go to menu> settings > DECT > register > press BASE 1, then it says “ENTER PIN CODE” enter “0000”. 6) Device will start searching and should say success on the screen. Now refresh the web interface and the IPEI should have a long digit number instead of 0000000000000. it will now be registered and working. If you follow the guide above and still have problems, contact our support team. With many company travel budgets tightening, conferencing phones are becoming an essential tool for minimising costs and improving productivity for all types of businesses. Leading conference phone manufacturers, Konftel offer a wide range of solutions to meet your customer’s individual needs, including systems for those people on the move. 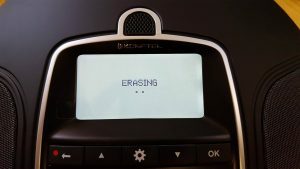 The Konftel 300Wx offers a wireless DECT solution, allowing users to hold conference calls where and when it is convenient for them, without the need for network points or power sockets. 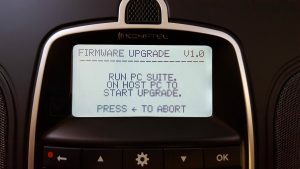 Specially designed to be the hub of your communications, the Konftel 55W allows you to simply connect your computer, mobile phone/tablet or desk phone for superior audio quality. The Konftel 300IP combines all of the benefits of IP telephony with conferencing functionality, ideal for meetings and boardrooms. For pricing and stock information, please see our reseller portal ProSys, if you do not have a ProSys account and would like to register your interest with us, please complete our ProSys account request form. We are delighted to offer ProVu resellers some excellent money-saving promotions across our range of Conferencing Solutions. Available until the end of the year and whilst stocks last, ProVu resellers can purchase both the Konftel 300Wx and Yealink CP860 Conference Phones at reduced prices. Pricing and stock information is available on our reseller portal, ProSys. If you would like to become a ProVu reseller, you can apply via our online reseller application form.